I recently roasted a whole free-range chicken, and this time I did something I had never done before – I saved the carcass and used it to make my own homemade chicken broth. It was actually really easy to make and much cheaper than buying store-bought broth. I also really liked the fact that I was able to use the entire chicken without wasting any of it and that I didn’t have to worry about my broth having any unnatural ingredients like MSG or other artificial flavors in it either. The recipe I used was from a book called The American Frugal Housewife . It was written by Mrs. Lydia Marie Child and was a popular guidebook for 19th-century homemakers. The book had several different editions, but the one my recipe came from was the 12th edition published in Boston in 1833. 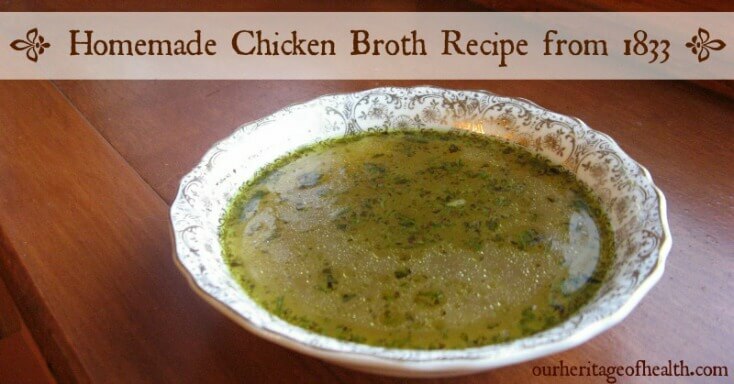 This old-fashioned homemade chicken broth recipe is full of flavor and nutrition. 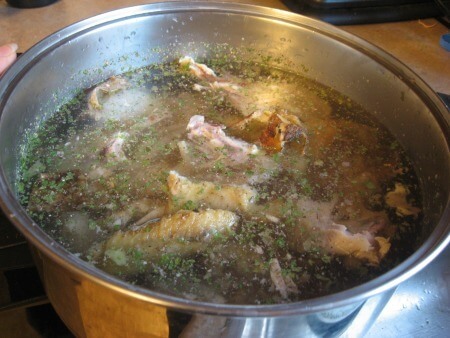 Now that I’ve tried making my own broth, I can’t believe I ever used to just throw the chicken carcass away! This is the version of the recipe that I used. Since Mrs. Child’s recipe doesn’t specify any amounts for the herbs and spices, you can adjust the amounts as you like. 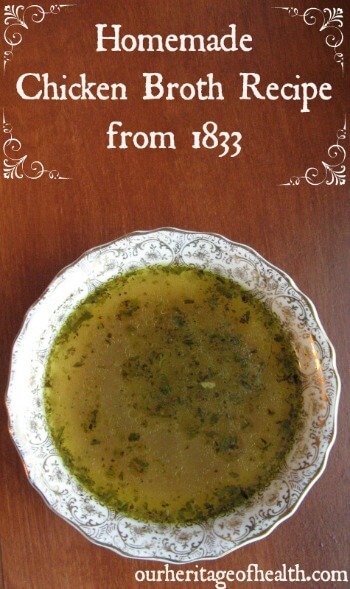 This recipe includes nutmeg, which was a common 19th century flavoring. I wasn’t sure at first how the nutmeg would be with the chicken, but the flavors actually pair really nicely together, and the nutmeg is very subtle and adds just a hint of spice. You can add a few crumbled-up crackers or breadcrumbs like the recipe suggests, or some rice as a thickening agent. Or if you prefer a grain-free broth, you can just let the broth simmer for a bit longer to thicken. This is completely optional (and it takes a little getting used to at first), but another great way to make a nice thick, rich broth is to add chicken feet to the stock pot along with the chicken carcass. The little farm where I buy my pasture-raised eggs sells chicken feet from their meat chickens, so I get some to add to my broth whenever I stop by there. The chicken feet add a lot of extra gelatin and minerals to the broth, and whenever I use them, my broth actually thickens like jello when it’s in the fridge. If you don’t have a good source of chicken feet from healthy chickens, though, (or if the idea of having chicken feet floating in your broth is just too weird), the broth will still turn out perfectly fine without them. 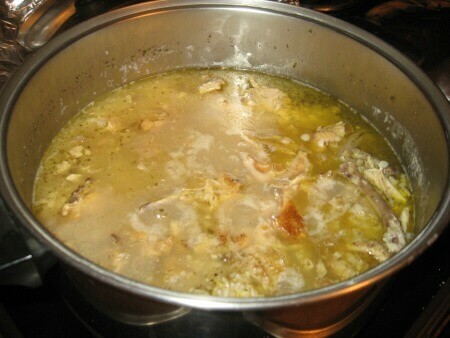 Divide the carcass into four pieces and put them into a large pot filled with the 3 quarts of water. Add the rice if you like, and then heat the pot until it is simmering. Add the herbs and spices and use a spoon to stir everything around a bit. Cover the pot and let it simmer until the bits of leftover meat have fallen off the bones. Every once in a while, it’s a good idea to just check to make sure the water level is ok, and add a bit more if it looks like it’s getting too low. I usually simmer mine for about 10-12 hours, but you can let it go for even longer depending on how much time you have, or if you’re running short on time, you can let it simmer for less. The longer it simmers, though, the more nutritious the broth will be. Finished simmering and ready to strain. Once the broth has finished simmering, strain it through a colander into a large bowl, and then it’s ready to use for soup or homemade gravy, or any other recipes that call for broth. I like to divide my broth into smaller freezer-safe containers so I can just take a little out of the freezer whenever I want to use some for soup or chicken pot pie or something like that. I like to use 8 ounce Mason jars so that my broth is already pre-measured and I can easily take out a cup to use in a recipe. This post is linked to Sunday School at Butter Believer and Hearth and Soul at Elsa Cooks. Congrats on your first broth! That’s so exciting. And thanks for sharing with Sunday School! I just started reading the American Frugal Housewife a few weeks ago- it’s absolutely terrific, but I haven’t tried any recipes from there yet. I’d like to try out chicken soup with nutmeg- that’s something I’ve never done before! Thanks for the inspiration! Yeah, it’s a great book, and it’s pretty amazing how much of the advice in it can still be relevant to today almost 200 years after it was first written! I definitely need to get this book. This is exactly the kind of recipes I love making. 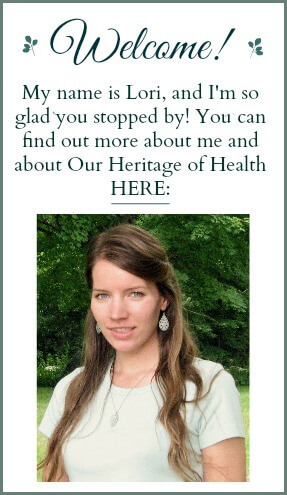 Thanks so much for stopping by Hearth and Soul! I will be featuring your recipe on my blog tomorrow. Yeah, this book is a great primary source for information about old-fashioned cooking recipes and methods. Thanks so much for featuring my recipe on your blog! This is the best and simplest recipe for broth. I made some using wild rabbit as well and it is perfect. Thank you for sharing.